"Much of education is oriented toward making a living instead of making a life." Dr. Roger Walsh. In his wonderful TEDxUniversityofNevada talk "Hackschooling Makes Me Happy." Logan La Plante introduces the happiness research of Dr. Walsh. (It's worth watching the 13 minutes video--especially with your kids). "When I grow up, I want to be happy." Logan says, and presents Dr. Walsh's 8 key TLC's or Therapeutic Lifestyle Changes as the user guide. So many of us are oriented toward making a living instead of making a life. In the juggling of priorities, the happiness ball keeps falling on the ground and rolling under the couch where it lies forgotten--along with dust bunnies and stale popcorn. What if juggling priorities is the wrong way of going about being happy? What if leading a happy life is more like making (and eating) a really good picnic in which there are the most delicious ingredients eaten in good company in a gorgeous, quiet setting? We tend to think This or That, rather than This AND That. I can make money or be home with my kids. I can work hard or have good relationships. But maybe the key is to blend or stack. "How can I do this and that and that and this? How can I build a good career and be happy and work with people I like and get outside during the day and contribute and pray and have fun?". In healthy lives and companies, there is evidence of people blending what makes them happy into their work lives. There are walking and running groups where coworkers run through parkland at lunch. Or meal-shares where colleagues take turns bringing healthy lunches for each other. "Cone of silence" drinks where concerns are shared and worked through. Yoga classes, massage, meditation groups or sleep pods for de-stressing. Mentoring, volunteerism and fundraising campaigns build relationships and spirits while in service to others. Some, like the Mustard Seed combine TLC's by making delicious food in service to the homeless. Hmm. You don't have to change things up too much to make life just a bit better. To help shift my thinking and doing, I'll make myself a report card using the 8 TLC's as headings and post it here when I'm done. At the start of each week, I'll look at where I'm feeding my happiness on all 8 fronts, then report back in to myself at the end of the week. Maybe I will get my boyfriend, and my mom and dad to do it with me? Want to join me? Who can you bring along on your lifestyle hack? A while back I wrote in Plumage and Dazzle how important it is to dress-up your town, your event, your message and your invitation to showcase the experience you promise to deliver. 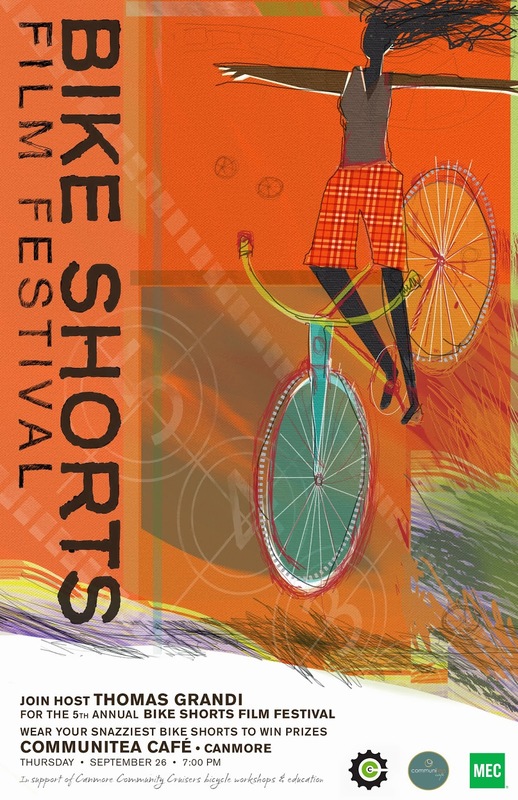 Wonderful Jean McAllister of the design house Dark Horse Company created this brilliant poster for the short film fest Bicycle Shorts. In it, is a great example of a classic poster, so beautiful you want to keep it on your wall long after the event is over. Its energy, whimsy and colour extends a compelling invitation. An invitation sets the tone of what to expect at the party, so you want it to be lively and fun, then your guests arrive in the right frame of mind. Too bad corporate meeting invitations aren't this fun! Maybe they could be? 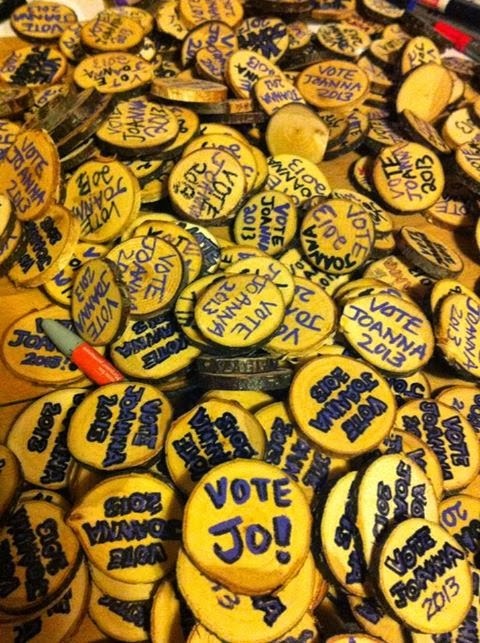 I thought this was a creative and green way to make campaign buttons. Kudos to Councillor Joanna McCallum for her creativity! 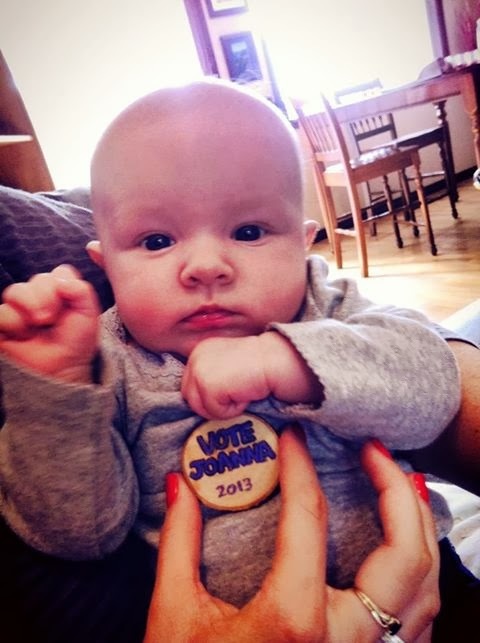 Who would not want to sport one of these babies! I've had enough of hackneyed quotes from famous people. Einstein's once novel quote,“We can not solve our problems with the same level of thinking that created them” may be true, but I'm sick of it! Cited over and over again in order to herd groups toward innovative or design-thinking, it's a taser with dead batteries. Freshly home from back-to-back business trips in Las Vegas (really it was business) with some fun, wildly smart clients, and Vancouver for a conference, I received an email from design genius John Tong. The founder of +tongtong and his wife, Anne, had just returned from Milan. "Being able to mix business with pleasure is one of the secrets to living well." His quote summarizes precisely what I'd experienced during my two recent trips. While exploring key factors in identifying niche markets with a client, I'd posted into our collection of yellow stickies one which read "intuition". As I did, the man who'd made the suggestion earlier blurted, "Intuition? I didn't think that was allowed!" Mike Smith, the President and founder of ReadySmith Advisers, summarized cultural bias in that moment. The topic of intuition spiced many conversations throughout Vancouver's Corporate State event. The event is attended by powerful women in business. Kicking off the event, keynoter Sherry Cooper, the former Chief Economist with BMO Nesbitt Burns, balanced her data-filled financial forecast of the U.S. and Canadian economies with, "I trust my intuition in forecasting." In her opening remarks on the Auction Economy, innovation expert Karen Morris said, "My intuition is beating in my breast." Pure poetry. Later in that same discussion Karen noted, "Values and Innovation are inextricable tied." She illustrated how using a reference to John Donne's brilliant 16th century poem Valediction Forbidding Mourning, "If they be two, they are two so, as stiff twin compasses are two; thy soul, the fixt foot, makes no show to move, but doth if th'other do." Now that's a quote I never tire of but used to describe business relationships--that's new. Of our obssession with discounted goods and services resulting in RFPs awarded to lowest bidder regardless of quality or ability to deliver, Karen asked, "What is the right price for the wrong thing?" Nudging Canadian businesses to innovate she prodded, "All businesses need to be asking 'How can I change what, how and by whom I am paid?'" Brilliant. Simply brilliant. Who was it who said, "Insanity is doing the same things over and over again expecting different results"? Oh yeah, Einstein. Let's take the dude's advice and sample the sayings of today's brainiacs. Go ahead, I dare you to float an original quote to see what can happen. Or as Evelyn Bailey, Vice President of Software with IBM said, "My job is to break glass and not accept business as usual."